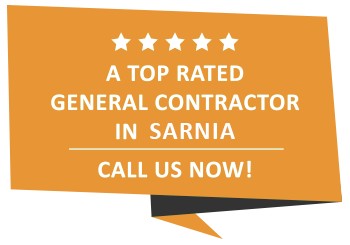 Bathroom Renovations | Sarnia | Carosyl Home Additions Inc. The average person will spend about 1 ½ years of their lifetime in the bathroom. When it comes to your home, you spend a lot of time making sure it is as comfortable and welcoming as possible, and this includes the bathroom however renovating a bathroom can seem like a daunting task for most. Whether it is updating a main bathroom, enlarging a half bathroom or creating the master bathroom ensuite of your dreams, if you are in the Sarnia region then Carosyl Home Additions Inc. can help you create the ideal bathroom for your home. At Carosyl Home Additions Inc., we have over 30 years of experience designing and executing all aspects of home remodeling including bathroom renovations. From the consultation and design to the final touches of hardware and paint, we pride ourselves on our effective communication with our clients. Even if you don’t have a clear vision for the remodel, our expert designers will present you with as many options as possible. Ever dreamed of an overhead rain shower and large soaking tub? Would you like marble countertops that perfectly compliment your new flooring? We can help you make the right decisions to ensure that your new bathroom exceeds even the highest of expectations. When entering a project of this magnitude, many people worry about the disturbance to their daily routines. At Carosyl Home Additions Inc., we understand that in order to be successful we need to minimize the amount of time your home is undergoing work and keep to a strict schedule. This is why many of our Sarnia area clients choose us to begin with- we will always do our best to stay within schedule and on budget. With Carosyl Home Additions Inc., there are no surprises – only beautiful new bathrooms that you and your family can enjoy for years to come. Carosyl Home Additions Inc. has built a strong and excellent reputation in the Sarnia area for creating the most tasteful and beautifully re-designed bathrooms. No matter what your needs are, we take pride in being able to meet them with our knowledge and experience. Contact Carosyl Home Additions Inc. if you are considering a bathroom renovation!